After regaling us with entertaining anecdotes about his life as a screen writer in Hollywood, the late Gill Dennis threw out a curve ball: “What was your greatest moment of shame?” He was teaching a workshop at the Squaw Valley Writers’ Conference called “Finding the Story.” Dennis co-wrote the screen play Walk the Line (2005) with James Marigold about the life of the famous singer, Johnny Cash, the son of a sharecropper from Arkansas. Dennis described to us how he “found the story” for the screen play through a series of frank, personal interviews with Johnny Cash, and those who knew him well. Writing truthful biographies about live subjects is a tricky, volatile business. Bird, the earnest, likeable narrator of W.B. 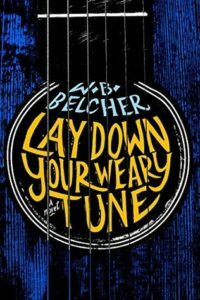 Belcher’s first novel, Lay Down Your Weary Tune, learns that lesson the hard way, when he is hired to ghostwrite a famous folk singer’s biography. Some of them believed his disappearance was an elaborate hoax, a ploy to sell records—Eli, after all, was known for this trickery and sleight of hand almost as much as he was known for his music. He spoke about being alive in an insane world, and he gathered all the pieces of the human entanglement with God and country and failed relations and mixed them with lust and longing, a whole spectrum of shared experiences. From there, the novel flashes backwards in time to reveal the events that lead to Eli’s disappearance. Bird, who first met Elijah Page at a concert in 2001, when he was still in college, describes the well-known musician as “faceless, the shadow of everyman.” Bird yearns for some unscripted life, but nine years later, he finds himself lost at age thirty, “a never-was musician” and “a sometimes music journalist.” His big break comes when he receives a phone call from Barry Gettleson, Eli Page’s manager, who commissions him to ghostwrite Eli’s biography. Eli himself was not enthusiastic about the book project and the interviews and instead, steered Bird into a number of home-improvement projects, like painting his house and chopping wood. Eli had become an irascible recluse and Bird noticed that there was no guitar in sight, and there was little music or joy in the house. Bird became increasingly frustrated by the elusive Page until he discovered a packet of letters from a mysterious H. M. in a secret room of records, posters and memorabilia from the sixties and seventies: Woody Guthrie, Thelonious Monk, Muddy Waters, Johnny Cash and Howlin’Wolf, among others. Some said I had the knack for speaking about the guy on the corner…who was out of work or the down-and-outer who was wrongly convicted. Civil rights, blackouts, dust storms, union riots, freedom here and in the mind—these are things to sing about. There’s never a shortage of people getting screwed. Eli Page, the fictional character, could be modeled on any number of folk musicians from the sixties, like Bob Dylan or Woody Guthrie, since many sang protest songs about the underdog. What is poignant is that Elijah Page, who sings the blues about other people’s troubles, has brought his own troubles upon himself, like a tragic Greek hero. At first, the young narrator thinks that being a rock star is a “charmed life.” The author’s serious, underlying message is that it is not: huge fame and success or “The Biz” is often a trap. Eli retreats behind a mask, and his promoter, Barry Gettleson, has also packaged him as – g “a cultural hero.” Bird realizes that the “unauthorized” story of Elijah Page is a lonely, sad one – he is an alcoholic whose mind is “becoming untethered.” Except for Jenny, who was a friend of his daughter’s, and his dog, Tig, he is an isolated figure. When Elijah realizes that Bird has taken his letters from Hadley, he succumbs to a self-destructive rage by burning all of his possessions in the fireplace and brandishes the shards of his broken guitar, like a knife. We also discover that the narrator, like Page, suffers from depression and has a problem with his identity. His father deserted his mother at a young age for a life on the road as a musician. The narrator finds an old tape among Page’s belongings and he recognizes his father’s voice, singing with Page. Eventually, Page tells him that the real reason he has been summoned to Galesville is out of an old promise to his friend to look out for him: Page didn’t give a fig about the book project. Yet Bird is not as naive as he seems. Bird, who has fallen in love with Jenny, confesses that he trashed his office at his “awful soul-numbing” job, suffered a nasty break-up with his wife and spent time in jail. No one has the corner on sadness in this depressed mill town, where the people distrust outsiders, art, or anything that is not easily pigeonholed. Because Eli Page is eccentric and uncommunicative, the townspeople suspect him of a number of burglaries. Jenny’s mural, which does not promote a patriotic view of the town, is vandalized. Jenny herself is no stranger to tragedy. She and Eliza, Elijah Page’s daughter, had a tragic car accident, where Eliza was killed. Even the person who seems to be the most conventionally successful can become unhinged, not only rock singers or Vietnam Vets. Casey, Bird’s friend, who has followed the American dream, becomes completely unraveled when his wife leaves him. I met a girl from Galesville. We had a life. For a few months. We had a life. We came here to these fairgrounds, thirty-something years ago, but then I left the tour and she didn’t make it. This is for her. And for our baby girl. Gretchen McCullough is a writer and translator, teaching at the American University in Cairo. Her stories and essays have appeared in: The Texas Review, The Alaska Quarterly Review, The Barcelona Review, NPR, Storysouth and Guernica. Translations in English and Arabic with Mohamed Metwalli include: Nizwa, Banipal, Brooklyn Rail inTranslation and Al-Mustaqbel. Her bi-lingual book of short stories in English and Arabic, Three Stories from Cairo (2011) and a collection of short stories, Shahrazad’s Tooth, (2013) were published by Afaq Publishers in Cairo. You can read more of her work by visiting her website.